This time, my husband and I went to the movies with our son, our daughter was busy. We went hoping for Man from U.N.C.L.E but it isn’t out until next week, so we settled for Fantastic Four. The movie was alright, I don’t know who directed it, but the overall feel of the movie didn’t have the same badda-boom of other Marvel movies. 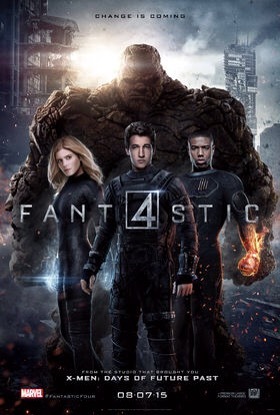 Was it better than the Fantastic Four movie with Jessica Alba and Chris Evans? I don’t know. I didn’t get emotionally invested in any of the characters the way I usually do, I also didn’t get an overarching sense of a greater theme or deeper meaning. There were definite bad guys, the military, defense contractors, greed and unchecked power, but I never got the sense that our “heroes” were quite “there” as Marvel heroes are, in the usual process of getting us, the audience to pull for them while they are saving the world. I never got to the rooting for the good guy part on behalf of the four, the story and direction were lacking somehow. I left the theater unexhilarated, this doesn’t happen to often. I am not sure if I would recommend this movie, I can easily see myself watching it on HBO instead of needing the big screen.